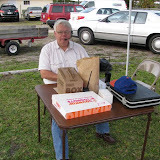 Yes, I have a working handheld 2M radio and would like to help support the event. We will need at least three checkpoint stations in addition to Net Control. The race start point is NOT at the band shell this year but further west nearer the county courthouse. The registration starts at 0700 so we need to be set up in advance. If you have a working and charged 2 meter handy-talkie we could use your help with the event. Please register for the event if you can help- we will update the list if any changes are required.